Poly-Ned is active in ”textile architecture”: functional and aesthetic design using textile and wire mesh fabric that may be provided with functional and aesthetic coatings and/or printed material. Are you looking for an air dome? Poly-Ned supplies the solution for numerous activities that are impossible to perform outdoors. You should also call in Poly-Ned for an external wall, roof or (acoustic) stretch ceiling (designed using a mesh or textile cloth). 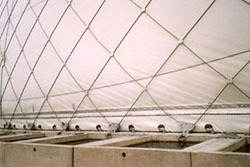 Even an air cushion roof is possible! The renovation of an existing wall or ceiling (including ceiling systems) can be realised relatively inexpensively and quickly by using textile and wire mesh fabrics. 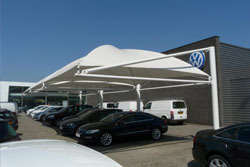 A tensile structure, a canopy or a roof can be designed in a spectacular manner by using a Poly-Ned membrane. 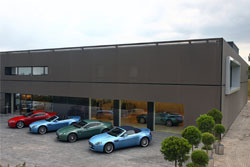 Poly-Ned processes the Precontraint and Batyline programmes of Ferrari as well as others. Many of the mentioned applications can be designed as a permanent or temporary structure. Combinations with modern (LED) lighting technologies can lead to spectacular effects! 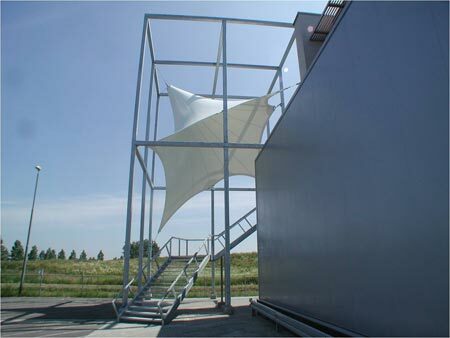 Poly-Ned supplies fabric and structures that are fire-resistant for the construction and industry sectors. Industrial products include antistatic roofing solutions and pressure-regulating membranes. Technology is constantly evolving. Also in the field of textile architecture. 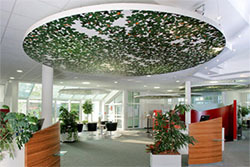 Poly-Ned is an ambitious company with motivated employees, which enjoys to extend 35 years of experience. New materials, new techniques, Poly-Ned thinks in clear and affordable solutions and likely ‘out of the box. Innovation is therefore of paramount importance to Poly-Ned. But Poly-Ned remains levelheaded to provide solutions also for standard requests / projects. 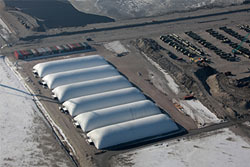 Every project is unique for Poly-Ned and from start to finish (right from the first draft until tensioning the last cable) the complete project is performed by own personnel. Furthermore Poly-Ned pursues a pleasant work approach, where customers and employees are treated fairly and with respect. 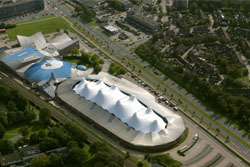 A team of in-house experts will, next, assemble and install the structures on site wherever this may be in the world. 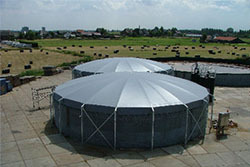 Poly-Ned delivers fully engineered solutions that are often also based on new materials and state-of-the-art technology. Poly-Ned supplies customisations; every product is unique when it comes to design and engineering. Poly-Ned has implemented a subdivision that includes a number of product groups. The product groups are the following: Air domes, Ceilings & walls, External walls, Tensile structures, Fire-resisting products, Industry and Tents. 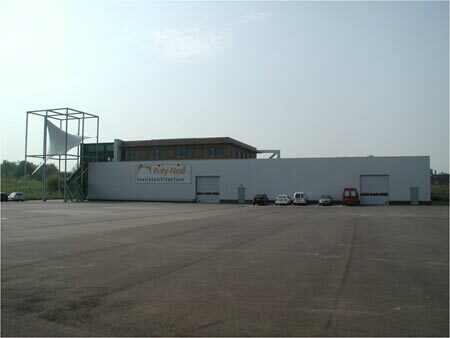 Poly-Ned and its employees have 30 years of experience in in-house development and engineering as well as production of industrial textile and wire mesh cloth based on many types of fabrics (‘fibres”), combinations with aramid, Kevlar, glass, polyester, carbon, PE, PP and many ferrous/non-ferrous metals. A lot of experience has also been gained in the area of composite/reinforced materials in various combinations of fabrics/mixtures with, for example, epoxy resins, PVC, PVDF, PVDC, PTFE, PU, etc., and sheet metal or wire netting. 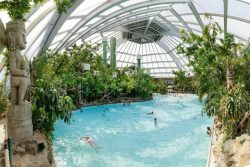 At Poly-Ned, ample experience has been built up in fire-resistant/flame extinguishing-fibreglass cloth and the processing of this in, for example, fire-resistant structures. Poly-Ned works in partnership with TNO/Effectis in Rijswijk as well as other organisations with regard to this issue. Poly-Ned has its own laboratory facilities. Various materials are tested and further developed in this laboratory and tests are preformed to determine the different relevant properties of the applied materials. This last issue is also, for example, done within the framework of the quality policy with the aim of checking the specified properties of materials from suppliers. The knowledge level in the area of the fibre strength of plastics in the broadest sense can be called very high. Regularly publications appear on our projects, from small articles to extensive reports, or film shots. Where possible we refer to the full text of the publication.